From 1957, it’s I Was A Teenage Frankenstein! This film was produced as a direct result of the box office success of I Was A Teenage Werewolf. Just as in Teenage Werewolf, Whit Bissell plays a mad scientist who makes the mistake of trying to play God. (He also makes the mistake of keeping an alligator in his lap but that’s another story.) The end result …. Teenage Frankenstein! The makeup on the Teenage Frankenstein is probably the best thing about this film. If nothing else, this film features a monster who actually looks like he was stitched together in a lab. Enjoy and please be sure to read my review of this film at Horror Critic! Last week, I did an overview of producer Irwin Allen’s first two sci-fi shows, VOYAGE TO THE BOTTOM OF THE SEA and LOST IN SPACE. 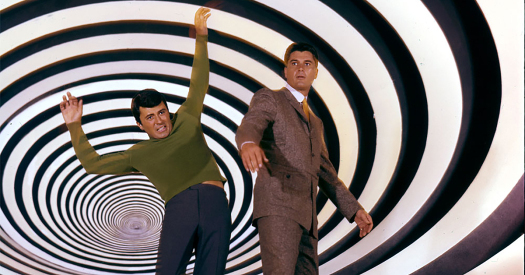 Today, Allen’s final shows in the quartet, THE TIME TUNNEL and LAND OF THE GIANTS! Jacqueline Susann’s Once Is Not Enough (for that indeed is the unwieldy title of this little movie) opens with a shot of two Oscars sitting on an end table. Those Oscars belong to Mike Wayne (Kirk Douglas), a legendary Hollywood producer who hasn’t had a hit in way too long. He’s struggling financially. He may even have to fire his maid (Lillian Randolph), despite the many years that she’s spent making sure he wakes up and remembers to take a shower before leaving the house. What choice does Mike have but to marry Deidre Milford Granger (Alexis Smith), the world’s sixth richest woman? Mike doesn’t even mind that Deidre is having an affair with Karla (Melina Mercouri). That makes sense to everyone by Mike’s daughter, January (Deborah Raffin). As Mike explains it, January’s name came about as a result of January being born in January. So, I guess if I was Mike’s daughter, I would have been named November. Everyone in the film thinks that Mike’s being terribly clever by naming his daughter after her birthday but, to me, that just sounds lazy. Agck! That sounds like the set up for a Freudian nightmare but instead, the film’s rather blasé about the whole incestuous subtext of January’s relationship with her father. Mike is soon pushed to the side as the movie follows January as she tries to make a life for herself in New York City. Fortunately, she’s able to land a job at a magazine, working for her old college friend, Linda (Brenda Vacarro). In college, Linda was smart and homely but she has since had so much plastic surgery that January doesn’t even recognize her. Linda’s either found the greatest plastic surgeon in the world or else January is just really, really stupid. Things don’t really work out between January and David but don’t worry! January soon meets the world-renowned author, Chest Hair McGee (David Janssen)! Okay, actually his name is Tom Colt. January is convinced that she and Tom are going to be together forever. Of course, Mike hates Tom. And there is the fact that Tom’s married. Literally everyone in the movie tells January that Tom is never going to leave his wife but I guess we’re still supposed to be shocked when Tom tells her that he’ll never leave his wife. He does, however, thank her for allowing “a broken-down old man” to “feel like a stud.” In the end, nothing really works out for January but she’s such an annoying and vacuous character that you really don’t mind. Based on a novel by the same author who gave the world The Valley of the Dolls, Once Is Not Enough is a movie that manages to be both remarkably bad and also surprisingly watchable. Some of that is because the film is a time capsule of 70s fashion, 70s decor, and 70s slang. A lot more of it is because the cast is made up of such an odd mishmash of performers and acting styles that nobody seems like they should be in the same movie. Kirk Douglas grimaces. George Hamilton looks embarrassed. David Janssen lurches through the film like a drunk trying to remember where he lives. Alexis Smith and Melina Mercouri chew every piece of scenery they can find while Brenda Vaccaro shouts her lines as if hoping the increased volume will keep us from noticing what she’s actually saying. Poor Deborah Raffin wanders through the film with a dazed look on her face. Can you blame her? Interestingly enough, Jacqueline Susann’s Once Is Not Enough actually was nominated for an Oscar. Brenda Vaccaro was nominated for Best Supporting Actress. Admittedly, Vaccaro does probably come the closest of anyone in the cast to creating an interesting character but I still have to wonder just how weak the Supporting Actress field was in 1975. Anyway, this incredibly silly and tacky film is a lot of fun, though perhaps not in the way that it was originally intended to be. Between the nonstop drama, the unintentionally hilarious dialogue, and the weird performances, the film plays out like a cartoon character’s dream of the 70s. Tomorrow, we’ll take a look at another silly and tacky film from the same decade, 1978’s The Betsy! Duuuuuuuuude! The American Ninja is back! In this sequel to the first American Ninja, ninja Joe (Michael Dudikoff) and sidekick Jackson (Steve James) are now Army Rangers. They have been assigned to provide security at an embassy on a small Caribbean island. At first, it seems like an easy gig but then Joe discovers that a large number of Marines have recently vanished. According to the only witness, they were abducted by men dressed in black. Joe and Jackson know what that means! The Marines are being set up by a traitor in their own ranks, Tommy Taylor (played by Miguel Ferrer look-alike Jonathan Pienaar). Taylor is being blackmailed by a master criminal known as, I kid you not, Leo the Lion (Gary Conway, who also co-wrote the script). Leo is brainwashing the Marines, shooting them up with all sorts of drugs and transforming them into zombie-style ninjas. Doing away with any pretense towards reality, American Ninja 2 is pure comic book action. A bad guy even says, “It’s the American Ninja!” when he sees Joe. It’s a strange film. On the one hand, it is full of goofy humor and it even has a streetwise kid sidekick, all things that would indicate that it was made to appeal to kids. On the other hand, the first cut was reportedly so violent that it got a dreaded X-rating. The final version still has enough impalings, decapitations, and throwing stars to the head to earn its R.
With its combination of nonstop action and Steve James one-liners, American Ninja 2 is both a worthy sequel and a worthy addition to the Cannon library. Still, it bothers me that at least a few of the ninjans that Joe and Jackson killed were probably just brainwashed Marines. That amounts to a lot of innocent victims being killed by our heroes. The life of an American ninja is never an easy one.